Duach is a Breton witchblade held prisoner in Cidhna Mine. It is unknown how long he has been there, but is believed that it has been around seven years since he saw the daylight. If you ask about his past he will tell you that "I'm a Forsworn. One of our raids went bad, and I got captured. Would've been fine dying for the Reach with my kinsmen, but the Silver-Bloods want their ore mined, so they threw me in here." 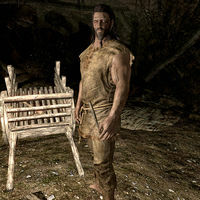 He will make no secret of his hatred for the Nords and he can frequently be heard saying "Whenever I get out of here, I'm going to go kill a Nord." If you persuade him he will be sympathetic to you and remark "Getting the shakes, huh? All right. Take it. Old gods keep you." You may also intimidate him and, if successful, he will hand over the skooma while telling you "Easy there. I didn't mean nothing. Take it." If you try to fight him for the bottle he will remark "That's it!" before challenging you to a brawl. After this little fight he will be rather annoyed and mumble "Damn addicts always stealing from me." He will then give you the Skooma with an angry remark: "Here. I hope you choke on it." This page was last modified on 30 January 2018, at 00:25.